As a follow-up to Cesarean Awareness Month, we have been focusing on some of the rarer possible downstream complications of cesareans. Today we discuss Cesarean Scar Pregnancies. Warning ─ this one's not for the faint of heart. Again, I would reiterate that many cesareans are truly life-saving and necessary, and many others are probably prudent. However, cesareans are not without risks and should not be done lightly. The extremely high cesarean rates in certain areas of this country and around the world has very distinct public health implications, both in the immediate period around the cesarean and for years afterwards. In particular, the long-term implications of cesareans are under-recognized. We've already discussed abnormal placental implantation (placenta previa, placenta accreta, placenta increta, placenta percreta), which is one of the most significant risks to future pregnancies after cesarean section. As a follow-up to this, we also discussed placenta previa in more detail. Another potential very serious complication of pregnancies after prior cesarean is an ectopic pregnancy in the cesarean scar itself. An "ectopic" pregnancy is one that implants outside of the uterus. Most often, ectopic pregnancies are tubal (in the Fallopian tubes), but sometimes they occur outside of uterus in the abdomen, in the cervix, etc. However, with the rise in cesarean rates, care providers are now seeing an increase in the previously extremely rare situation of an ectopic pregnancy implanting in the cesarean scar. This is called Cesarean Scar Pregnancy, or CSP. The main symptom is usually vaginal bleeding during early pregnancy; sometimes this is painless and sometimes it is accompanied by significant abdominal pain. Very high hCG levels are another symptom that raises the suspicion for CSP. However, some women with CSP have no obvious symptoms at first. Since many pregnancies experience early spotting, most women don't take vaginal bleeding in the first trimester too seriously. However, women with a prior cesarean and significant bleeding/abdominal pain may want to consider an early vaginal ultrasound, just in case, especially if it is accompanied by very high hCG levels. A few care providers feel that every women with a prior cesarean should have an ultrasound in very early pregnancy to check for CSP, although this is by no means standard. The downside to this, of course, is that any prenatal testing carries with it potential for false positives and unnecessary worry. Because the non-sonographic symptoms are unclear and easy to ignore at first, many cases of CSP go undetected initially. Even when the patient presents with symptoms to a care provider, the diagnosis may be missed; the 2012 review found that about 13% of CSP are missed or misdiagnosed at first. Thus, some CSP patients only get recognized once the uterus has ruptured and they are in hypovolemic shock. Many of these patients have to undergo a hysterectomy to stop the bleeding. Bottom line, the longer a Cesarean Scar Pregnancy continues, the worse the outcome in most cases. Therefore, most resources agree that it's important to recognize and deal with a CSP as early as possible. If the CSP is caught early, outcomes improve and fertility can often be preserved. Transvaginal ultrasound is usually reasonably accurate for diagnosing CSP, although the diagnosis can still be missed even with ultrasound. Often color flow Doppler imaging is helpful. Occasionally an MRI may be used if other results are ambiguous. Prior cesarean is not the only risk factor for Cesarean Scar Pregnancy. A history of uterine infections and prior D&C procedures are also risk factors, as is a short inter-pregnancy interval after a cesarean. Treatment with In Vitro Fertilization may also be associated with CSP, although this is not clear. Some authors have speculated that recent uterine suturing technique changes (single-layer, various suture materials) may also have an effect, though there is little data to support or refute this. Obviously having a prior cesarean scar is the most important risk factor for CSP. When CSP occurs, nearly all clinicians believe that there is little choice but to end the pregnancy because the growing pregnancy will quickly become life-threatening to the mother, and the fetus is extremely unlikely to survive anyhow. This places parents in the very difficult position of having to make a choice to end a pregnancy in order to save the life of the mother. A few providers have managed a Cesarean Scar Pregnancy expectantly. This has been done for those who object to termination under any circumstances, in parents who hope to avoid the difficult choice to end a pregnancy, or in hopes that the pregnancy will move into the uterus with time and become viable. Since a Cesarean Scar Pregnancy is rarely sustainable and will often miscarry on its own with time; some parents hope that taking a wait-and-see approach can relieve them of the difficult choice to end a pregnancy. However, this approach does present significant risk to the mother. There have been a few extremely rare instances of Cesarean Scar Pregnancies that resulted in viable infants. Usually these are pregnancies where the gestational sac grows towards the uterus, eventually becoming mostly intrauterine pregnancies. Even then, most doctors recommend a planned cesarean at 28-30 weeks as a precaution against later uterine rupture, and usually assume that placenta accreta accompanies the CSP (making hysterectomy a distinct possibility). Continuing the pregnancy in hopes of being the rare exception that results in a live baby is understandable but risks life-threatening complications because uterine rupture is very common as a CSP progresses. The 2012 review notes that patients advised to take a "wait and see" approach often ended up with an emergency hysterectomy and infant death anyhow. 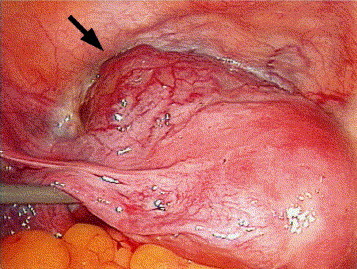 It is likely that if a developing pregnancy in a caesarean section scar were to continue to the second or third trimesters, there would be a substantial risk of uterine rupture with catastrophic haemorrhage, with a high risk of hysterectomy causing serious maternal morbidity and loss of future fertility. There is also a danger of invasion of the bladder by the growing placenta. A pregnancy that protrudes through the scar, if viable, can implant on other abdominal organs and continue to grow as a secondary abdominal pregnancy. As a result, women may experience uterine rupture, major hemorrhages, and internal damage to nearby organs. Many lose their fertility permanently via hysterectomy. Occasionally, women have lost their lives with a Cesarean Scar Pregnancy, although this is very unusual in developed countries now because of the use of ultrasound for early detection. Clearly, this is a dilemma with far-reaching consequences and there are no easy answers. Most clinicians believe that the only reasonable treatment for a Cesarean Scar Pregnancy is to end the pregnancy, but the best method for that is still being debated. There are a wide variety of treatments used for CSP, including D&C, systemic methotrexate, local injection of methotrexate, Uterine Artery Embolization, laparoscopic or hysteroscopic surgical treatments, and others. The relative rarity of CSP makes it hard to know which approach is best and therefore the standard of care on this is still evolving. A 2012 survey of case reports in the medical literature found that there has been a huge variety of treatments for Cesarean Scar Pregnancies, but that many resulted in significant morbidity (44%). They reviewed the various treatments used and analyzed the results. According to the 2012 survey, D&C (Dilation and Curettage) was the most common treatment used for CSP, but it was associated with high rate complications (nearly 62%), and often resulted in hemorrhage. The authors concluded that this was not a good choice for treatment of a CSP. The authors also found that giving methotrexate systemically to the mother was associated with a 62% morbidity rate. This was because secondary treatments were often needed and these had a high complication rate. The authors recommended against this treatment too. In Uterine Artery Embolization (UAE), an interventional radiologist inserts a small catheter into an artery in the leg, runs it up to the arteries that feed the uterus, and injects small particles to reduce blood flow to the uterus. UAE had a complication rate of 46%, so the authors recommended against UAE as a single treatment for CSP. However, UAE is often used in conjunction with or after other therapies to help reduce severe bleeding. Operative hysteroscopy (examination of the inside of the uterus with a fiber-optic tube inserted via the cervix, then surgical intervention as needed) had a much better complication rate of 18%. Injecting methotrexate directly into the gestational sac was the treatment associated with the least maternal morbidity in the review. When combined with an intramuscular injection of methotrexate, the complication rate was slightly less than 10%. After this injection, the body slowly breaks down the leftover tissues, so treatment must be followed long-term to be sure everything is resolving fully, but there is less need for surgical intervention and all its risks. Many of the complications reported in the literature review resulted because clinicians were not aware that increases in hCG concentrations could be expected with the treatment, Dr. Timor-Tritsch noted. "Many secondary treatments were triggered not by bleeding, but by the observation of a post-treatment increase the hCG cycle and vascularity," he said. "The treatments often resulted in escalation of the critical situation and often hysterectomy." "Knowledge of the naturally occurring increase of the hCG volume in blood vessels with a slow resolution could have avoided a secondary resolution," Dr. Timor-Tritsch said. Other treatment options include laparotomy or laparoscopy. This is a surgical excision of the gestational sac and repair of the uterus via opening the abdomen up (laparotomy) or doing the surgery through a small hole in the abdomen (laparoscopy). After a cesarean scar pregnancy, it may take a while for the mother to recover. Bleeding may continue off and on for quite a while. Treatment with methotrexate often takes several months to resolve the situation ─ in some reports, it took up to a year. Often follow-up testing is needed. And of course, emotional support is needed, since the parents have just been through a very difficult ordeal. Although most women with a CSP do not choose to have another pregnancy, some do. If the CSP was caught early enough and their uterus was able to be preserved, subsequent pregnancy is certainly possible. Researchers generally suggest that the mother wait a good while before trying to conceive again, since closely-spaced pregnancies may be a risk factor for CSP. Furthermore, if methotrexate or other drugs were part of the treatment, it may take a while for all traces of these drugs to be out of the mother's body. So waiting a while before attempting to conceive again may be a good idea. Although there are risks, outcomes are reasonably good in pregnancies after CSP. Most authors recommend careful early surveillance of a post-CSP pregnancy in case of repeat Cesarean Scar Pregnancy or abnormal placentation. There is a somewhat higher rate of miscarriage and repeat CSP, and the risk for uterine rupture and placenta accreta is also higher. Case reports have occasionally recorded deaths in mother and/or baby due to uterine rupture in a pregnancy after CSP, so careful monitoring of the pregnancy may be appropriate. Many post-CSP pregnancies are delivered by planned repeat cesarean section because of the perceived potential for uterine rupture, although it is difficult to estimate the actual risk for uterine rupture under these circumstances. On the other hand, some authors advocate for vaginal birth in order to avoid further scarring of the uterus. The number of pregnancies after prior CSP is so small that it's difficult to draw any conclusions about the best course of action. Although Cesarean Scar Pregnancy is thankfully still rare, it is on the rise, and likely will continue to rise in parallel with cesarean rates. Of course, it's important to note that absolute numerical risk of this complication is low. Very few women with prior cesareans experience this complication. Therefore, as an individual mother, it's unlikely that you would experience a cesarean scar pregnancy. However, from a public health point of view, it's also important to note that the more cesareans that are done world-wide, the more women are susceptible to this problem and the more cesarean scar pregnancies we will see, even while they remain a rare risk for any one individual. The incidence of Cesarean Scar Pregnancy (CSP) is difficult to pinpoint because of its relative rarity and the diversity of baseline cesarean rates in various areas. This is also a fairly new area of research, with mostly case reports rather than population-wide studies. But its increase can be noted if you look closely at the research. One 2002 study notes, "Only 19 cases have been reported in the English medical literature since 1966." However, a 2004 study, only two years later, looked for case reports that were made after 2002, and found 66 new case reports in only two years. A recent 2012 survey of the literature found 751 case reports. Obviously, the incidence appears to be on the rise. The increase in case reports may be partly due to higher cesarean rates, but also is probably due to increased awareness of CSP and a willingness to document them as a complication of prior cesareans. But there's little doubt doctors are seeing them in greater numbers than in the past. Exact numbers will depend on the study and the underlying risk factors of the population, such as how high its cesarean rate is, how many women have been exposed to D&C (another risk factor for CSP), the usual parity of the population etc. Even so, some general numbers can be found. One review found a rate of 1 cesarean scar pregnancy per 1800 - 2200 normal pregnancies (all pregnancies, prior cesarean or not). Another study found a similar rate of 1 CSP per 1800 normal pregnancies. However, that doesn't tell you what your risk for CSP is if you've had a prior cesarean. An Israeli study found the CSP rate more along the lines of 1 CSP per 3000 normal pregnancies, but this dropped to a rate of 1 CSP per 531 pregnancies in women who had had cesareans in the past. Rounded up slightly, about 0.2% of women who had cesareans experienced a Cesarean Scar Pregnancy in a later pregnancy. Interestingly, this is beginning to approach the incidence of uterine rupture in spontaneous labor among women with a prior cesarean (which is generally around 0.4 - 0.5%). Interestingly, about half the time Cesarean Scar Pregnancy occurred in a woman with only one prior cesarean. It is not clear from research whether multiple prior cesareans increases the risk for CSP, but it is clear that when CSP does occur, it can happen in women with only one prior cesarean. That's why preventing every unnecessary cesarean matters. Cesarean Scar Pregnancy is an extremely serious problem. Although rare, its incidence is on the rise in parallel with the high rate of cesareans being done these days. Because it is rare, this is not a complication that individual mothers with a history of prior cesarean should lose much sleep over. However, from a public health point of view, it is a concern. Because many cesareans are done because of VBAC bans, out of fear of liability, for convenience, as a routine repeat cesarean, or for other questionable indications, the increasing rate of Cesarean Scar Pregnancy is a sadly avoidable nightmare in many cases. This is yet another reason why it's so important to care providers to make sure that Vaginal Birth After Cesarean remains accessible, and why they need to prevent as many unnecessary first cesareans as possible. Implantation of a pregnancy within the scar of a previous cesarean delivery is the rarest of ectopic pregnancy locations. Only 19 cases have been reported in the English medical literature since 1966. If diagnosed early, treatment options are capable of preserving the uterus and subsequent fertility. However, a delay in either diagnosis or treatment can lead to uterine rupture, hysterectomy, and significant maternal morbidity. Although expectant and medical managements have been reported, termination of a cesarean scar pregnancy by laparotomy and hysterotomy, with repair of the accompanying uterine scar dehiscence, may be the best treatment option. A cesarean scar (ectopic) pregnancy occurs when a pregnancy implants on a cesarean scar. 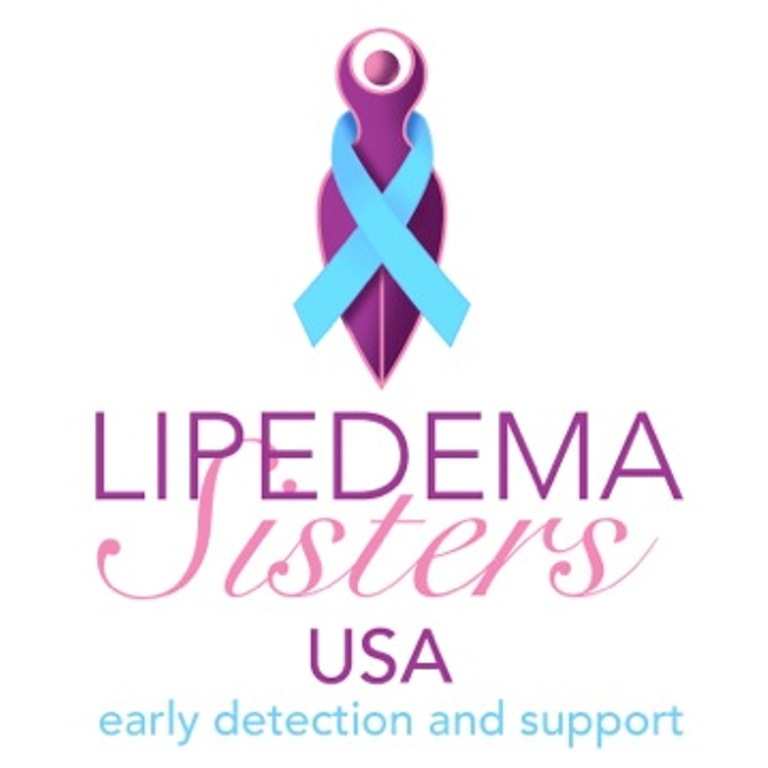 This condition is an uncommon but potentially devastating occurrence. The incidence is increasing as cesarean deliveries become more common. Early recognition of the salient sonographic findings is critical because a delay can lead to increased maternal morbidity and mortality. Magnetic resonance imaging is a valuable troubleshooting tool when sonography is equivocal or inconclusive before therapy or intervention. Early diagnosis by sonography directs therapy and improves outcomes by allowing preservation of the uterus and future fertility. We review the imaging features, differential diagnosis, complications, and treatment of cesarean scar pregnancies in the first trimester. Cesarean scar pregnancy is rare. However, there has been a rapid increase in the reporting of such cases in recent years. Most of the cases reported in the literature were diagnosed early in the first trimester. Possible management options proposed are pertinent to an early diagnosis. We present a case of a cesarean scar pregnancy diagnosed at 16 weeks that posed a dilemma with regard to management. The patient subsequently suffered a ruptured uterus, which was preserved at surgery. Once considered extremely rare, implantation of a pregnancy within the scar of a previous cesarean section is becoming more common. In fact, its incidence is now higher than that of cervical ectopic pregnancies. We identified 5 cases of ectopic pregnancy implanted in a prior cesarean section scar at our institution since 2004. We outline the criteria for the first-trimester sonographic diagnosis of cesarean scar ectopic pregnancy, including a new sign of lower uterine segment ballooning, which has previously not been reported. Clinicians must have a heightened awareness of this serious and potentially fatal pregnancy complication. ...METHODS: We conducted a retrospective study in a large tertiary hospital in Israel. The study included 18 women with a diagnosis of cesarean scar pregnancy between 2000 and 2009. RESULTS: The incidence of cesarean scar pregnancy among our parturient patients was 1 per 3000 for the general obstetric population and 1 per 531 among those with at least 1 cesarean delivery. Sixteen were treated primarily with methotrexate. Two were treated primarily by surgery, and 2 more were treated by surgery after failed methotrexate treatment. After cesarean scar pregnancy treatment, 7 women conceived spontaneously, and 1 conceived by in vitro fertilization-intracytoplasmic sperm injection. The remaining 10 (55%) did not wish to conceive again. Two of the women who became pregnant (25%) had recurrent cesarean scar pregnancy. CONCLUSIONS: This study shows encouraging results for fertility performance and obstetric outcomes after treatment of cesarean scar pregnancy. Nevertheless, the risk of recurrent cesarean scar pregnancy is not negligible. ...Fifty-nine articles that met the inclusion criteria provided data on the clinical presentation, diagnosis, and treatment modalities of 112 cases of cesarean delivery scar pregnancies. TABULATION, INTEGRATION, AND RESULTS: Review of the 112 cases revealed a considerable increase in the incidence of this condition over the last decade, with a current range of 1:1,800 to 1:2,216 normal pregnancies. More than half (52%) of the reported cases had only one prior cesarean delivery. The mean gestational age was 7.5 +/- 2.5 weeks, and the most frequent symptom was painless vaginal bleeding...Expectant management of 6 patients resulted in uterine rupture that required hysterectomy in 3 patients. Dilation and curettage was associated with severe maternal morbidity. Wedge resection and repair of the implantation site via laparotomy or laparoscopy were successful in 11 of 12 patients. Simultaneous administration of systemic and intragestational methotrexate to 5 women, all with beta-hCG exceeding 10,000 milli-International Units/mL required no further treatment. CONCLUSION: Surgical treatment or combined systemic and intragestational methotrexate were both successful in the management of cesarean delivery scar pregnancy. Because subsequent pregnancies may be complicated by uterine rupture, the uterine scar should be evaluated before, as well as during, these pregnancies. ...The management of Cesarean section scar pregnancies included transvaginal surgical evacuation, medical treatment with local injection of 25 mg methotrexate into the exocelomic cavity and expectant management. RESULTS: Eighteen Cesarean section scar pregnancies were diagnosed in a 4-year period. The prevalence in the local population was 1 : 1800 pregnancies. Surgical treatment was used in eight women and it was successful in all cases. The respective success rates of medical treatment and expectant management were 5/7 (71%) and 1/3 (33%). Five women (28%) required blood transfusion and one woman (6%) had a hysterectomy. CONCLUSIONS: Cesarean section scar pregnancies are more common than previously thought. When the diagnosis is made in the first trimester the prognosis is good and the risk of hysterectomy is relatively low. ...CSP is a type of ectopic gestation associated with a high risk of serious complications. The cause of this condition and the best management are still unclear. However, some medical and surgical treatment modalities have been suggested. The main objectives in the clinical management of CSP should be the prevention of massive blood loss and the conservation of the uterus to maintain further fertility, women's health and quality of life. Current data suggest that expectant management should not be recommended, whereas there are accumulating data suggesting that early diagnosis offers single or combined medical and surgical treatment options avoiding uterine rupture and haemorrhage, thus preserving the uterus and fertility. SUMMARY: No universal treatment guidelines for the management of CSP have been published up to now. The lack of data on the best evidence should encourage any individual case report and further multicentre studies for recommendations establishment. An unintended consequence of the rising cesarean section rate is abnormal placentation in subsequent pregnancies, leading to the clinical complications of placenta accreta and cesarean scar pregnancies. Both of these clinical entities are associated with high rates of maternal morbidity and mortality. This article reviews the potential mechanisms by which uterine scarring may lead to abnormal trophoblast invasion, the association of cesarean section with placenta accreta and scar pregnancies, current management, and suggestions for future research to reduce the incidence of these potentially devastating complications of pregnancy. ...We present four cases of cesarean scar ectopic pregnancy diagnosed within a 6-month period between 2007 and 2008. Their initial presentations and management are discussed, followed by a review of the published literature summarizing both diagnostic and management recommendations. ...Transvaginal ultrasound and colour flow Doppler provides a high diagnostic accuracy with very few false positives. A delay in diagnosis and/or treatment can lead to uterine rupture, major haemorrhage, hysterectomy and serious maternal morbidity. Early diagnosis can offer treatment options of avoiding uterine rupture and haemorrhage, thus preserving the uterus and future fertility. Management plan should be individually tailored. Available data suggest that termination of pregnancy is the treatment of choice in the first trimester soon after the diagnosis. Expectant treatment has a poor prognosis because of risk of rupture. 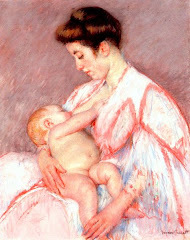 There are no reliable scientific data on the risk of recurrence of the condition in future pregnancy, role of the interval between the previous caesarean delivery and occurrence of caesarean scar pregnancy, and effect of caesarean wound closure technique on caesarean scar pregnancy. In this article, we aim to find the demography, pathophysiology, clinical presentation, most appropriate methods of diagnosis and management, with their implications in clinical practice for this condition. BACKGROUND: Cesarean scar ectopic pregnancies have been diagnosed with increasing frequency in the last decade. There is no consensus of management for these pregnancies; however, prior reports have suggested best results using either combination methotrexate therapy or surgical excision. CASE: We present a case of failed systemic and local methotrexate therapy requiring operative management. CONCLUSION: Cesarean scar ectopic pregnancies can have disastrous outcomes, including uterine rupture, massive hemorrhage and maternal death. Although this is the first case to report a failure of the combination therapy, major morbidities did not occur. We believe this is due to our choice of expedient surgical management. In the last decade, diagnosis of caesarean scar (CS) pregnancy and abnormal placental invasion has gone up significantly. It appears that the history of previous caesarean section is the predisposing factor common to both conditions. Until now, these are treated as a separate entity and therefore managed differently. Recent available evidence suggests that these are not a separate entity but rather a continuum of the same condition. If the caesarean scar pregnancy is managed expectantly in the 1st trimester, most likely it evolves into placenta accreta. This leads invariably to peripartum hysterectomy for postpartum haemorrhage (PPH) and severe maternal morbidity. Early diagnosis and intervention may give a favourable outcome. ...METHODS: During a 6-year period, 12 cases of Cesarean scar pregnancy were diagnosed using transvaginal color Doppler sonography and treated conservatively to preserve fertility...RESULTS: The incidence of Cesarean scar pregnancy was 1:2216 and its rate was 6.1% in women with an ectopic pregnancy and at least one previous Cesarean section...Patients were treated as follows: transvaginal ultrasound-guided injection of methotrexate into the embryo or gestational sac (n = 3), transabdominal ultrasound-guided injection of methotrexate (n = 2), transabdominal ultrasound-guided injection of methotrexate followed by systemic methotrexate administration (n = 2), systemic methotrexate administration alone (n = 2), dilatation and curettage (n = 2), or local resection of the gestation mass (n = 1). Eleven of the 12 patients preserved their reproductive capacity; the remaining patient, treated by dilatation and curettage, underwent a hysterectomy because of profuse vaginal bleeding. The Cesarean scar mass regressed from 2 months to as long as 1 year after treatment. Uterine rupture occurred in one patient during the following pregnancy at 38 + 3 weeks' gestational age. CONCLUSION: Ultrasound-guided methotrexate injection emerges as the treatment of choice to terminate Cesarean scar pregnancy. Surgical or invasive techniques, including dilatation and curettage are not recommended for Cesarean scar pregnancy due to high morbidity and poor prognosis. From December 2009 to April 2010, six patients with caesarean scar pregnancies (CSPs) underwent the transvaginal removal of ectopic pregnancy tissue and repair of a uterine defect. Transvaginal surgery was performed uneventfully in all cases. The operating time ranged from 45 to 80 minutes. Blood loss ranged from 50 to 150 ml. Serum β-hCG (β-subunit of human chorionic gonadotrophin) levels declined to normal levels within a month for all patients, and all patients recovered without complications. Our results show that the transvaginal removal of ectopic pregnancy tissue and repair of the uterine defect is effective, safe, and minimally invasive for patients with CSP. ...No therapeutic modality is suggested to be entirely efficacious and safe for preserving uterine integrity. We present here a 29-year-old woman with vaginal bleeding and a gestational sac with a viable embryo of 6 weeks of age that was implanted in a cesarean section scar. Serum beta-hCG levels were 16 792 mIU/mL. Following an unsuccessful treatment course of systemic methotrexate, the patient underwent operative hysteroscopy. Minimally invasive hysteroscopic resection of the ectopic gestational mass without major complication appears to be an alternative therapeutic approach with minimal morbidity and preservation of future fertility. OBJECTIVE: The objective of the study was to assess the efficacy of uterine arteries embolization (UAE) for the treatment of cesarean scar pregnancies (CSP). STUDY DESIGN: Forty-six women with CSP were identified between March 2008 and March 2010. All of the patients underwent UAE combined with local methotrexate. RESULTS: Forty-five patients were successfully treated. One patient had an emergency hysterectomy after 20 days because of massive vaginal hemorrhage. The mean time until normalization of serum β-human chorionic gonadotrophin was 37.7 days, and the mean time until CSP mass disappearance was 33.3 days. The mean hospitalization time was 10.5 days. The complications were mainly fever and pain, which were alleviated with symptomatic treatment. All 45 patients had recovered their normal menstruation at follow-up. CONCLUSION: Bilateral uterine artery chemoembolization with methotrexate appears to be a safe and effective treatment for CSP and causes less morbidity than current approaches. ...We reviewed the literature concerning the occurrence of early placenta accreta and cesarean section scar pregnancy. 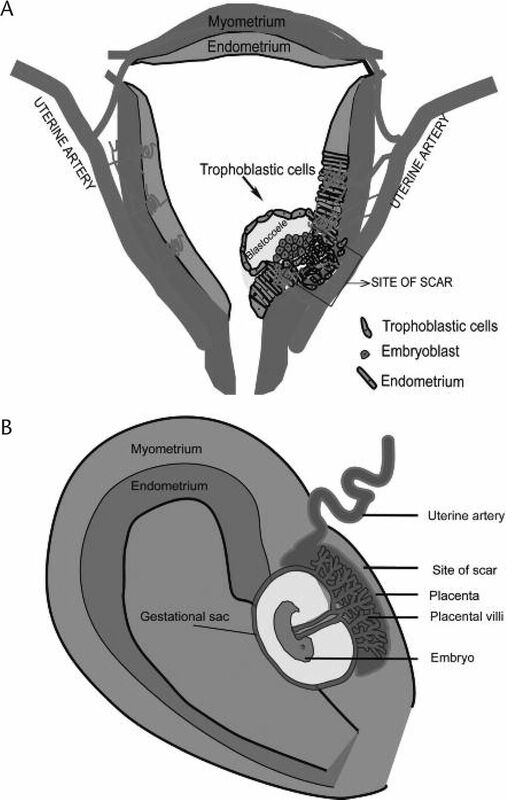 The review resulted in several conclusions: (1) the diagnosis of placenta accreta and cesarean scar pregnancy is difficult; (2) transvaginal ultrasound seems to be the best diagnostic tool to establish the diagnosis; (3) an early and correct diagnosis may prevent some of their complications; (4) curettage and systemic methotrexate therapy and embolization as single treatments should be avoided if possible; and (5) in the case of cesarean scar pregnancy, local methotrexate- and hysteroscopic-directed procedures had the lowest complication rates. ...CASE: A 21-year-old, gravida 3 para 2 woman was diagnosed at 13.5 weeks' gestation by pelvic ultrasound and magnetic resonance imaging with a cesarean scar ectopic pregnancy and placenta increta. Surgical removal of the pregnancy via exploratory laparatomy with intraoperative use of vasopressin minimized initial blood loss. However, extraction of the placenta increta resulted in uncontrolled bleeding, requiring a supracervical hysterectomy. CONCLUSION: This is the first case report, to our knowledge, of a late-first-trimester cesarean section scar ectopic pregnancy with placenta increta. Early identification of the ectopic pregnancy may allow for more conservative, nonsurgical management. However, with a more advanced gestational age and placenta increta, surgical management is most appropriate to minimize associated maternal risks. A transverse wedge resection of the implantation site, uterine artery embolization, uterine artery ligation, endovascular balloon catheters, or uterine artery tourniquet may help decrease bleeding during surgical extraction of the pregnancy and placenta increta, and also may prevent a hysterectomy. ...METHODS: The study included those women who received treatment for their Caesarean scar pregnancies between April 1999 and October 2005. Their ability to conceive, the time it took to become pregnant and outcomes of subsequent pregnancies were all recorded. RESULTS: 40 women with Caesarean scar pregnancies were managed in our unit. The uterus was conserved in 38/40 cases. Follow-up data were available in 29/38 (76%) of women. Twenty-four out of 29 (83%) attempted to become pregnant. Twenty-one out of 24 [88%, 95% confidence interval (CI): 75-100] women conceived spontaneously. Twenty out of 21 (95%, 95% CI: 86-100) pregnancies were intrauterine and one woman (5%, 95% CI: 0-14) had a recurrent scar ectopic. Thirteen out of 20 (65%, 95% CI: 44-86) intrauterine pregnancies appeared normal. Nine out of 13 (69%) were delivered by Caesarean section. Seven out of 20 (35%, 95% CI: 14-56) intrauterine pregnancies ended in spontaneous abortions. CONCLUSIONS: Our study shows that reproductive outcomes following treatment of caesarean scar ectopic pregnancies are favourable. The risk of complications including recurrent scar implantation appears to be low. BACKGROUND: Ectopic pregnancy in a cesarean scar is a rare but well-recognized potential complication of cesarean delivery. Multiple risk factors exist, including prior uterine surgery, a history of uterine infections such as endomyometritis, and a brief interval between uterine surgery and subsequent conception...CASE: This patient presented for a dating ultrasound examination at 4 6/7 weeks of gestation. Her history was significant for an ectopic pregnancy in her cesarean scar 3 years prior that was managed by surgical resection. The initial ultrasound examination was suspicious for a recurrent ectopic pregnancy in her cesarean scar. The diagnosis was confirmed on repeat ultrasonography at 6 weeks of gestation. She was treated with methotrexate, and the pregnancy resolved without complication. CONCLUSION: Ectopic pregnancy in a cesarean scar is an important diagnosis to consider in a woman who has had a history of cesarean delivery and whose early ultrasonography shows a thin, lower uterine segment or a low implantation site. If the diagnosis is not clear on initial ultrasound examination, the patient should be followed up with serial ultrasound examinations. Once recognized, patients with this complication may be treated either surgically or medically as indicated by the clinical situation. Hi, I am presently in hospital being treated for a CSP. It is a very difficult situation emotionally. Wanted to thank you for this article, which I found to be excellent. posy o, I'm so sorry you have experienced a CSP. What a terribly difficult thing to go through, both physically and emotionally. My heart truly goes out to you and all the others who have experienced this. Blessed healing to you. Katrina, I'm so sorry you went through this. What a terrible choice to have to make. I'm so sorry you lost your child. I'm sorry you lost your uterus too. If it would help, there are grief counselors who specialize in childbirth- and pregnancy-related issues in many cities. Ask around the doula and the midwife community to see if there's one in your area. It won't end your grief of course, but it can help to process it. No obligation to do it, of course. Just pointing out the option exists. My heart goes out to you and I wish healing for you as well. Blessings on you. My daughter is currently in hospital being treated for csp with methyltrexate. Does anyone know oh how long it takes for the baby's heart to stop beating? It seems so uncertain as to when the procedure will be complete. Also, do they always do surgery afterwards to remove it and repair the scar and uterus? Would really appreciate your comments, even though every case is probably different. Many thanks. A concerned mother & grandma. Anonymous, my heart goes out to you and your daughter. I'm so sorry. As for your questions, they are beyond my personal knowledge. You will need to ask her doctors. Many healing thoughts to your family. Anonymous, I'm so sorry to hear that you are in this difficult position. The decisions that must be made in the face of a Cesarean Scar Pregnancy are INCREDIBLY hard. As the post above notes, there have been a very very few cases where a CSP resulted in a viable infant, although usually quite premature. However, by FAR the most common outcome is a miscarriage, quite often with truly life-threatening complications for the mother. You also have to face the ironic possibility that by trying to preserve this baby, you might well lose your own fertility permanently, making it impossible to have your own babies in the future. You might even lose your life. I'm so sorry. This is a truly terrible choice to have to face. Only you can decide what to do. Don't let doctors pressure you into something you don't want; you are not obligated to follow their advice. But at the same time, you must truly grasp how VERY VERY risky it would be to proceed. You have to make this decision from a position of REAL understanding of the benefits and risks. I would suggest asking for a referral to a specialist who has dealt with many CSPs before. You can hopefully get more detailed information about the likelihood of the baby's survival and the magnitude of the risks that would be involved in trying. I would also suggest that you see a counselor that specializes in reproductive issues and will help you deal with the outcome, however you decide to proceed. Many hugs to you as you face these difficult decisions. I'm so sorry you are going through this.